Social VR somehow manages to feel both futuristic and retro at the same time. Even Ready Player One, last year's VR-themed Hollywood blockbuster, still traded heavily on '80s nostalgia. And it's been a long time since The Matrix presented its dystopian vision of an illusory reality. But the idea of communal virtual worlds has been a pop cultural fantasy for a long time now, for as long as we've even had the Internet. Because I am old, my first point of reference for social VR is the 1992 novel Snow Crash by Neal Stephenson, which coined the term 'Metaverse' to refer to the photorealistic virtual urban environment the characters could socialize in. Even further back, Willion Gibson's Neuromancer had action set in 'cyberspace' (now basically a synonym for the entire Internet). Various virtual worlds, most famously Second Life and MMOs like Ultima Online or World of Warcraft, were inspired by this fiction, but they just existed on our computer screens. Now, we have the hardware that the cyberpunk authors of previous decades could only dream of. So, where's our Oasis? Where's our Metaverse? I set out to explore the virtual worlds of social VR and see how far we've come. First, by hitting up a contact who's offering virtual real estate, and then, by going clubbing. There are a few options out there for the socially inclined VRnaut, but it's often the case that social media is best experienced with people we've already met. With that in mind, my first port of call in social VR was to hit up an old acquaintance. At Disrupt Berlin 2017, I met the creators of Somnium Space, who were building a persistent virtual world for social activities and fun, but also for business. Like in Second Life, you could buy property in Somnium Space and set up storefronts. I was curious to see how it was doing after a year. Most social VR experiences (I would hesitate to call them games) are free downloads from Steam, so you've got nothing to lose to give them a try. Somnium Space is no different, so I downloaded and dived in to catch up with Somnium Space's team. Somnium Space's vision is that of a small town by the sea, with a few extra points of interest like a planetarium, a stadium and a floating island suspended in the air, seemingly tethered to the ground with a long cable. As a floating body with a head and hands, player avatars are kind of limited to a handful of options and accessories. One thing Somnium Space does right is the UI and controls. Players can summon a virtual tablet which they can use to access settings and even browse the web, and of course, it has a front and back camera for selfies. Since we're all used to using our smartphones, it's an intuitive way to access options in Somnium Space without resorting to awkward abstract systems. Selfies from my trip were therefore mandatory, with the odd quirk that thanks to avatar limitations, one can't smile for the camera, only open your mouth when you're talking. A jaunt to Somnium Space is pleasant enough, with a few fun time killers to enjoy while talking. You can have a snowball fight, go bowling, eat a virtual hot dog from a stand and climb to the top of buildings (and jump off, it's perfectly safe). At particular events, crowds gather to listen to a musical act or attend a lecture in VR. But there's still not so much do to here, and the main square is far from a bustling hub. Potential can be seen everywhere though - in the fenced off plots of land that can be bought by users, and customized to build their homes, shops, museums, and so on with virtual objects. These privately owned pieces of virtual real estate can even have their own rules set by the owner. Prospectors are already staking their claims. Recently, Sominium Space raised more than $65,000 on Indiegogo selling virtual land and goods. As a glimpse of things to come, a virtual shopping mall contains a few storefronts for well known brands that have partnered with Somnium Space: Sony and Tesla. A Sony Pictures store teases the possibility of buying player avatars from the Marvel Cinematic Universe, whereas in the Tesla store, you can order an electric car. As you can see from the snaps, it's not much to look at compared to AAA videogames, though it has a few nice touches, like watching the weather change throughout the day/night cycle. But the creators of Somnium Space are preparing a 2.0 update that promises, among other things a graphical overhaul that will add more fine detail to the world, which will more than double in size. And while beauty isn't everything, it counts for a lot. In the long winters of my current home in the meatspace, it's nice to be able to transport myself to a virtual seaside and watch the sunset over the waves. One of the most interesting things happening in Somnium Space is a tool that seems a big step towards developing a real Metaverse: A Star Trek style transporter called Oasis (yes, like in Ready Player One). This allows teleporting not just to other locations within Somnium Space, but also to other distinct VR social apps, such as High Fidelity and JanusVR. The goal is that VR apps won't be siloed off, but rather, you'd be able hop from one to the other relatively seamlessly, traveling through an interconnected Metaverse and carrying some of your preferences and settings with you. There would be a toll for using this highway, in the form of ads served up during the transition. Somnium Space is a pleasant enough spot to hang out and shoot the breeze while playing simple games or watching the solar system in the planetarium. However, it's still a relatively grounded, realistic place. So after an afternoon in the small town, I decided to kick things up a notch and party. For this purpose, I hit up TheWaveVR, a different social VR platform designed purely for partying, a kind of hub for VR nightclubs and shows called Waves. While Somnium Space attempts a semi-realistic world, TheWaveVR goes full-on cyber psychedelia with a beautiful neon-on-dark aesthetic reminiscent of Tron. I suit up my nightlife avatar, which is yet another head/torso/hands affair, but more playful, with anime and alien heads available, as well as different body shapes. No one looks even remotely human in the neon masquerade. The WaveVR has a public area full of trippy, brightly colored effects and pulsating sounds and chimes, many of which you can affect by interacting with the environment. You can collect spherical items like 'trips' which, if used, wrap and transform the environment around you for a short duration, or 'poppers', which are not what they sound like, instead being items that produce different visual effects. These items can be gifted and form part of the social interaction in the wave. Chasing that authentic nightclub experience, I didn't hesitate to take a pill from a stranger. We shared a trip as the world around us became a bizarre, viscous bubble bath for a minute. Quick and comedown-free. And the parties? There's a regular schedule of events, both pre-made and live, but it doesn't stop there. Each player has a private area which they can use to create customize parties, so if you're the creative type, you can DJ parties designed according to your own audio-visual tastes. Welcome to the Metaverse, population: ??? Don't get me wrong, three perfectly nice people with whom it was fun and easy to talk to is nice, but it's hardly a party. Similarly, in Somnium Space I may have just spotted one or two visitors who weren't part of the team. This isn't to say that these places have no community - but it's still not the case that you can drop in at any given time and find lots of people to talk to. The Oasis, Metaverse, whatever you want to call it, is present in some embryonic form, and it's fun...but its won't be the sci-fi center of our social lives for a while. Social VR is fun and surprisingly easy to get into. We're so used to our digital interactions taking place via keyboard and mouse (or touchscreen) that there's an odd feeling at the beginning that we're re-learning our own nature to communicate with virtual bodies. My initial dips into social VR so far have been inspiring, and there are still others I have yet to explore in detail, like the meme-factory VRchat, or the party game-centric Rec Room. Most social VR platforms encourage users to create their worlds to invite friends and strangers to hang out in, and this is where some of the most exciting potential of an Internet based in VR is. Remember the personal websites of the '90s and early '00s? The good, the bad and the ugly, all before the social media giants standardized the way we express ourselves online? Hobbyists usually create more interesting things than corporations. Standalone headsets like the Oculus Quest, that do away with many of the barriers to entry for virtual reality, could give the VR Metaverse the surge in population it really needs. Even in my relatively geeky circle of friends, it doesn't take one hand to count the friends with a home headset that I could hit up for a hangout in VR. With the population will come the network effect of more content as people create their own areas and materials to share, and then we'll not only get to the stage of a massively shared VR social space like in Ready Player One, but all the fun that that entails. And of course, all the conflict that cyberpunk fiction has foreshadowed: monetization, corporate control, addictive escapism, data protection issues and potential neglect of our real-world environments. It's hard not to be seduced by the magical vision of playing and creating together in a shared illusion, and one can tell that many of the developers and early adopters are true dreamers, working to realize the inspiration and passion seeded into them by fiction years ago. 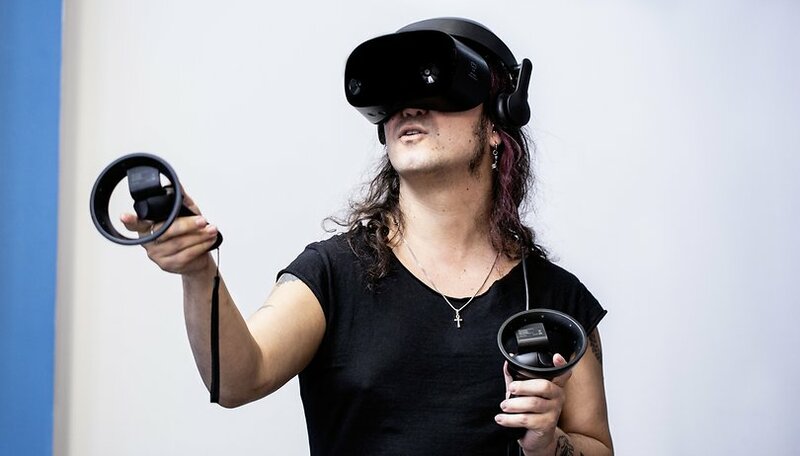 Somnium Space founder Artur told me that dreaming about VR worlds became 'unbearable' at some point before creating Somnium Space...but there are going to be difficult questions to ask on our way there that even idealists must grapple with. How close are we to the Oasis? We've already started our journey there, and there's no rolling back the advance of technology. Gaming, chatting, building, shopping, partying are all possible and only becoming more sophisticated with time. If developers of virtual worlds continue to connect, and it's in their interests to avoid fragmentation, the shared virtual Metaverse is an inevitability within our lifetime. It's then not too early to begin thinking more seriously, what do we want it to be like? Have you tried social VR apps? Would you like to? The ability to move between VR products is really the premium service. Personally, I suspect AR will be the dominant form of metaverse with pockets of full VR here and there.